FIKTECH – Industrial Knowhow and Techical solutions – has over 40 years of experience in solving a wide range of technical problems in virtually every industry. Thanks to specific knowledge in the area of industrial dustcontrol and the processindustry, we quickly recognize production problems and bring realistic solutions. FIKTECH consults, engineers, supplies components and manages projects up to turnkey. Shortly after start-up of a production process technical improvements ar required in order to reach the maximal output. FIKTECH assesses the problems in close cooperation with the customer and proposes several practical solutions and calculates the costs. Examples: Vortex Cabinet Coolers, Airknives, Venturi eductors, fluidisers, dust- and gassensors, ATEX-components and -solutions. We invite you to regularly visit our website, to stay informed about our innovations! 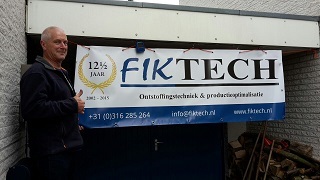 Managing director - owner Fiktech B.V.